Halloween may be over but that doesn't mean we still can't enjoy our pumpkins. 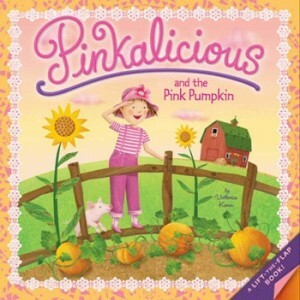 Taking a cue from the lurve and adoration my preschool kiddos have for this book, I brought in a garden-grown pumpkin for them to paint. I set out a trio of paint cups. Two with white paint and one with red. 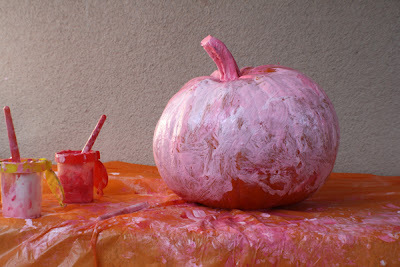 The kiddos were delighted to create their very own Pinkalicious pumpkin. Even better was the tub of soapy water for them to wash up with. For two days they painted and painted and painted some more. From two year olds to four year olds, that jumbo sized pumpkin was painted pinker than pink. We're gonna paint it some more tomorrow with a different color duet. It will be easy peasy. The sponge I set out was also enjoyed as kiddo after kiddo happily scrubbed that pumpkin clean. Check out the book stats down below and happy November!